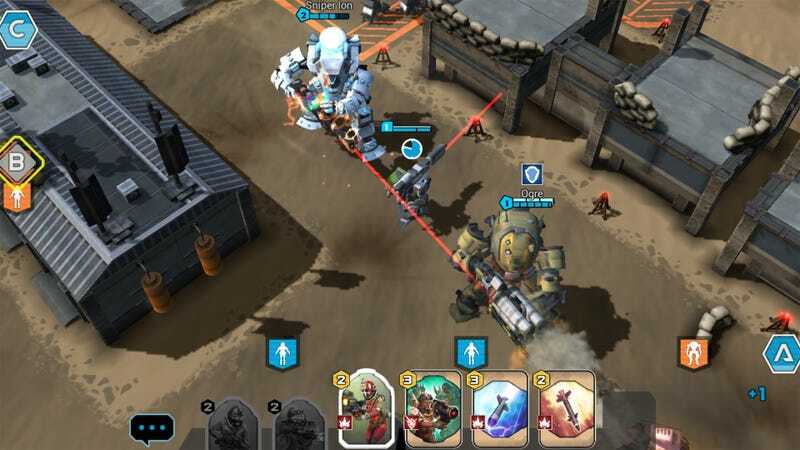 After scrapping card-based strategy game Titanfall: Frontline and starting from scratch, Respawn and Vince Zampella’s mobile studio Particle City finally have a mobile mech combat game on their hands in the form of Titanfall: Assault, available today on iOS and Android. It’s still a strategy game of sorts, and it’s still got collectible cards, but Titanfall: Assault is more of a Clash Royale-style troop deployment attack and defense game. Players face off on a map, attempting to capture and control three points or destroy the giant turret in the enemy’s base. When the countdown clock reaches the three minute mark, Titans can be deployed, upping the battle ante considerably. Titanfall: Assault is a free-to-play game, with various timer mechanics and the ability to purchase packs of troops, Titans and burn cards for in-game currency. I’ve played a few practice rounds so far, and the Titanfall spirit certainly shines through. I doubt I’ll stick around long enough to go deep into mech and merc collecting, but it’ll be good for the odd bathroom break distraction.